Home» Ap new gos » AP Up-Gradation of Guntakal Municipality to First Grade Selection Grade as per Go.No: 41. 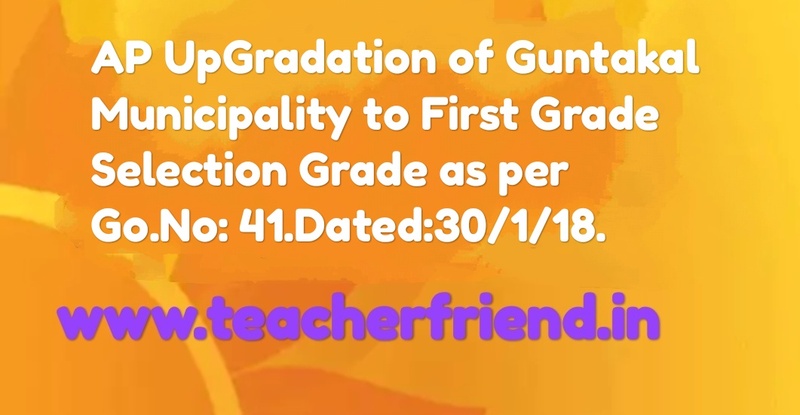 AP Up-Gradation of Guntakal Municipality to First Grade Selection Grade as per Go.No: 41. G.O.Ms.No. 32, MA&UD Department, Dt. 03.02.1995. G.O.Ms.No. 25, MA&UD Department, Dt. 23.01.2001. G.O.Ms.No. 370, MA&UD Department (Elec.II) Department , Dt. 30.04.2005. From the Director of Municipal Administration, A.P., Guntur, Lr.Roc.No. 22210/2010-D3, dated: 14.11.2017. In the letter 4th read above, the Director of Municipal Administration, Andhra Pradesh, Guntur has reported that the Municipal Commissioner, Guntakal Municipality, Ananthapuramu District has submitted the proposal for Up-Gradation of the Municipality along with Council Resolution and income particulars for the last five (5) financial years i.e. 2012-13 to 2016-2017.
is Rs. 39.00 crores i.e., for the years 2014-15 to 2016-17. Further, he has stated that as per Rule 3(vi) of Andhra Pradesh Municipalities (Gradation of Municipal Councils and Nagar Panchayats) Rules, 1995, issued in G.O.Ms.No. 32, MA&UD (J2) Department, dt: 03.02.1995, “Selection Grade Municipality means a Municipality with an annual income of rupees eight crores and above”. The Director of Municipal Administration, Andhra Pradesh, Guntur has requested the Government to issue necessary orders in the matter. Department, Dt.03.02.1995 as amended in G.O.Ms.No.25, MA&UD Department, Dt. 23.01.2001, have decided to declare and upgrade Guntakal Municipality from First Grade to Selection Grade. Accordingly, the following Notification will be published in the Andhra Pradesh Gazette. and the Director of Municipal Administration, Andhra Pradesh, Guntur.